Exploring has a variety of awards and recognition. Explorers can earn a Career Achievement Award in one or all 12 career fields. To earn a Career Achievement Award, the candidate must provide 50 hours of community service and complete any nine career achievements as outlined in the attached PDF file. The Explorer post advisor certifies that each Explorer has satisfactorily performed 50 hours of community service and verifies that each candidate has completed at least nine achievements within the career field. The fire/emergency services Exploring Proficiency Awards program provides an opportunity for posts and their Explorers to earn a series of recognition items that acknowledge their fire/emergency services Exploring experience. These recognize community service, fire prevention, fire/emergency services service, fire/emergency services training, emergency preparedness, tenure, and Explorer of the Year. Each proficiency area is intended to recognize experience, tenure, training, or leadership. These awards are intended to be worn on the fire/emergency services Explorer uniform only. The Law Enforcement Exploring Proficiency Awards program provides an opportunity for posts and their Explorers to earn a series of recognition items that acknowledge their law enforcement Exploring experience. These recognize community service, crime prevention, law enforcement service, law enforcement training, firearms training, emergency preparedness, tenure, and Explorer of the Year. Each proficiency area is intended to recognize experience, tenure, training, or leadership. These awards are intended to be worn on the law enforcement Explorer uniform only. The William H. Spurgeon III Award is the highest recognition for individuals and organizations contributing significant leadership to the Exploring program. 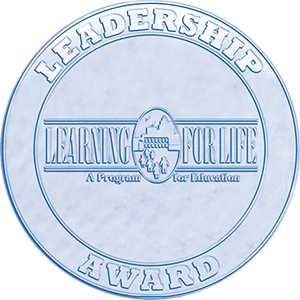 The Learning for Life Leadership Award is a distinguished award for Explorers, high school Learning for Life program participants, and adult volunteer leaders who have given exceptional leadership in Exploring or Learning for Life programs. The Leadership Award is available annually to all Explorer posts and Learning for Life high school groups. An adult leader supports Explorers in setting challenging but achievable goals in four program areas. Once an Explorer has achieved his or her goals, they should submit the form. The Explorer will receive a recognition from their local member of Congress. In recognition of these outstanding achievements, Learning for Life is proud to announce the availability of the President’s Volunteer Service Award, a prestigious national honor offered in recognition of volunteer commitment. Established in 2003, this Award is given by the President of the United States and honors individuals, families and groups who have demonstrated a sustained commitment to volunteer service over the course of 12 months. Lifesaving Award: Recognition may be given to a youth member or adult leader of Learning for Life where the evidence presented to the National Learning for Life office, in accordance with prescribed regulations, shows that he or she saved or attempted to save life under circumstances which indicate heroism and risk to self. Learning for Life will give consideration to resourcefulness and to demonstrated skill in rescue methods. In no case shall recognition be given where it appears that the risk involved was merely in the performance of duty or the meeting or an obligation because of responsibility to supervise and give leadership to the persons whose lives were saved. Meritorious Action Award: Recognition may be given to a youth or adult participant where the evidence presented to the National Learning for Life office, in accordance with prescribed regulations, shows that a significant or outstanding act of service, of an exceptional character, was performed. The action taken need not involve attempts of rescue or risk to self but must put into practice skills and/or ideals in Learning for Life. Recognition shall not be given where it appears that the action involved was merely in the performance of duty or the meeting of an obligation.